Preheat oven to 325 °F. Grease a 10-inch Bundt pan and place walnuts on the bottom of the pan. In a large bowl, place cake mix, pudding mix, eggs, oil, 1/2 cup water and 1/2 cup rum and mix with electric mixer on high speed until smooth, for approximately 2 minutes. 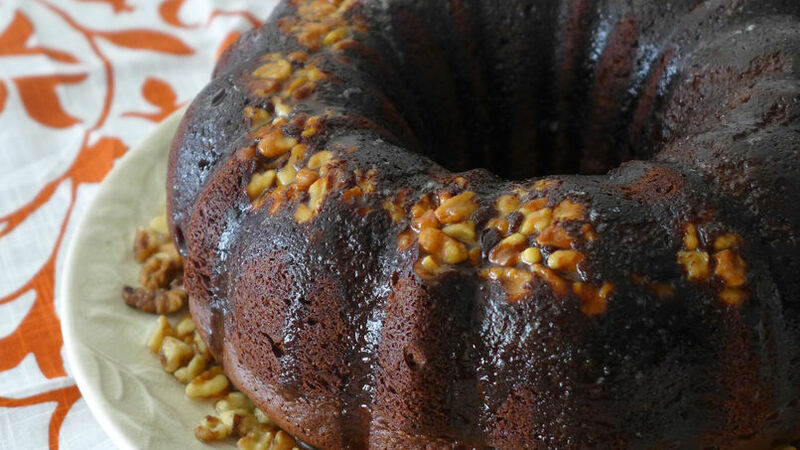 Pour batter into prepared Bundt pan over chopped walnuts. Bake for 50 minutes or until a toothpick inserted comes out clean. Cool for 10 minutes, unmold in a serving plate with rimmed edge. For rum glaze: In a medium saucepan, heat butter, sugar, 1/4 cup rum and 1/4 cup water over low-medium heat. Bring mixture to a boil for 2 minutes. Pour over warm cake and serve. Omit rum for a kid-friendly dessert. Looking for an elegant dessert recipe for an adult dinner party? Look no further! This chocolate rum cake will have your guests complimenting your baking skills to no end. Little do they know that this dessert can be prepared in just under an hour with basic ingredients and an effortless preparation, leaving you with enough time to enjoy your party. Shhhh, we won’t tell!